A quiet country church on the edge of the Lincolnshire Wolds. St Mary's stands near a site that was in use since at least the Roman period. This ancient building dates to at least the late Saxon period, with sections of the south wall surviving from this period. There is an 11th-century window with an unusual carving of a cat over it. 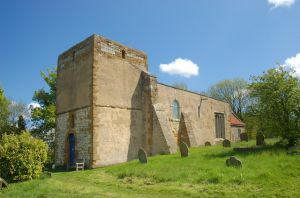 Sometime after the Norman Conquest, the Saxon church was rebuilt. It consists of an aisless nave and chancel, though there is some evidence to suggest that there was once a north aisle. The original 12th-century font from Barnetby is now in the North Lincolnshire Museum in Scunthorpe. This rare font, crafted sometime around 1170, is a rather extraordinary object, built entirely of lead, and covered with intricate orchid-leaf carvings. The most immediately striking aspect of the church is the short, squat tower, which looks like it was intended to rise much higher. The interior is blessedly untouched by Victorian restorers.